I want Easter to be a really big deal around here. Since we’re Christians, Easter is (or should be) our biggest holiday, and I want our family to really anticipate Easter together. 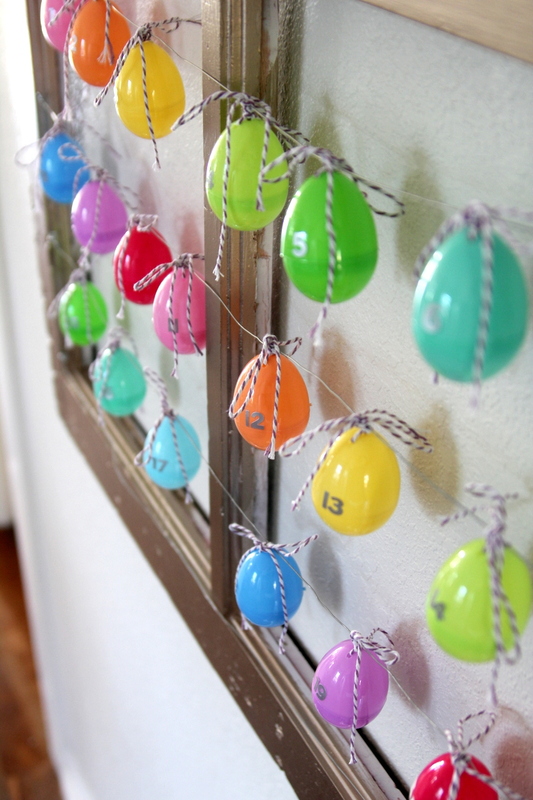 In fact, every time we hang up our Advent calendar, I think to myself that I should do something similar for Lent (the time leading up to Easter), complete with daily Easter activities, just like we do for Christmas. Now, this wades into some sort of tricky waters-I want our Easter preparations to reflect the more serious nature of the holiday. But I still want Easter to be the biggest celebration ever. 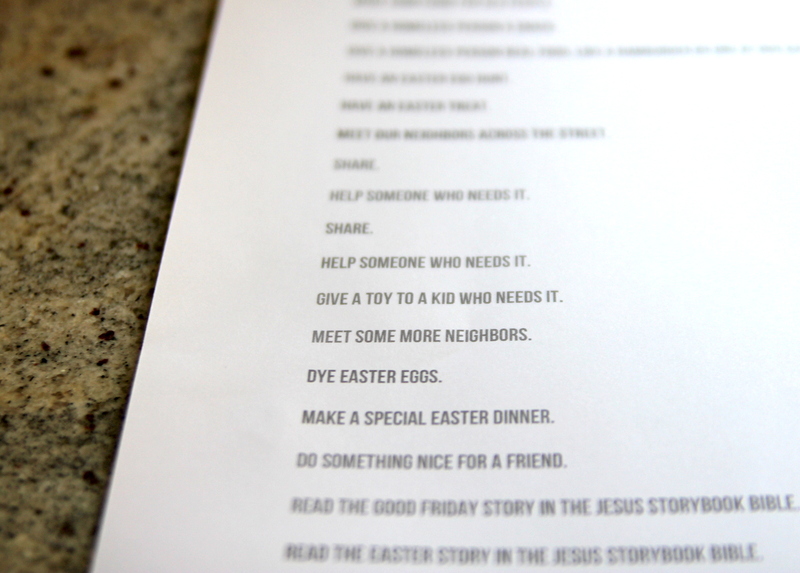 And, more importantly, since Easter is all about grace, I don’t want to confuse Burke and Piper Jane by making all of our Easter activities ‘do nice things for others’ because the most important concept of the entire holiday is that we can’t ever be ‘good’ or ‘nice’ without Jesus’s sacrifice anyway. Tricky. 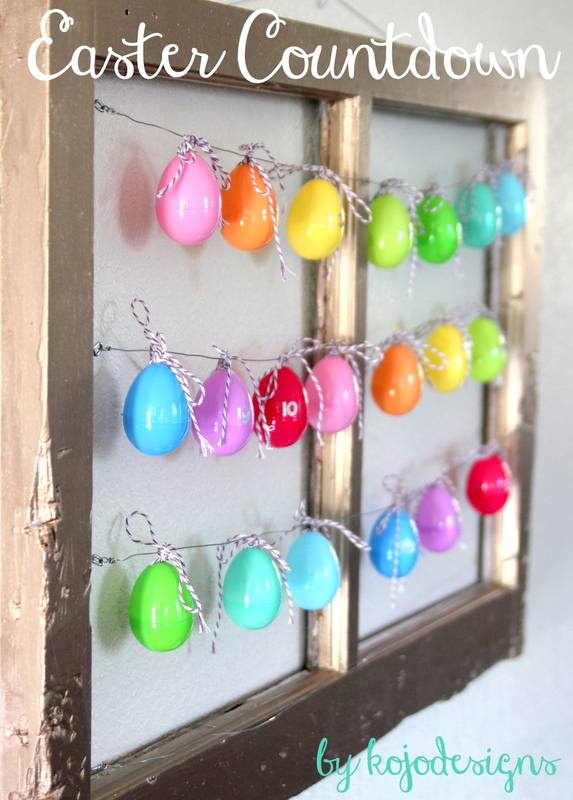 So this is what we’re doing this year- we made an Easter countdown, complete with activities (I strung baker’s twine through the holes already in the top of 20 plastic Easter eggs, numbered them with stickers, filled each one with a treat and an activity, and hung them on our metallic window). 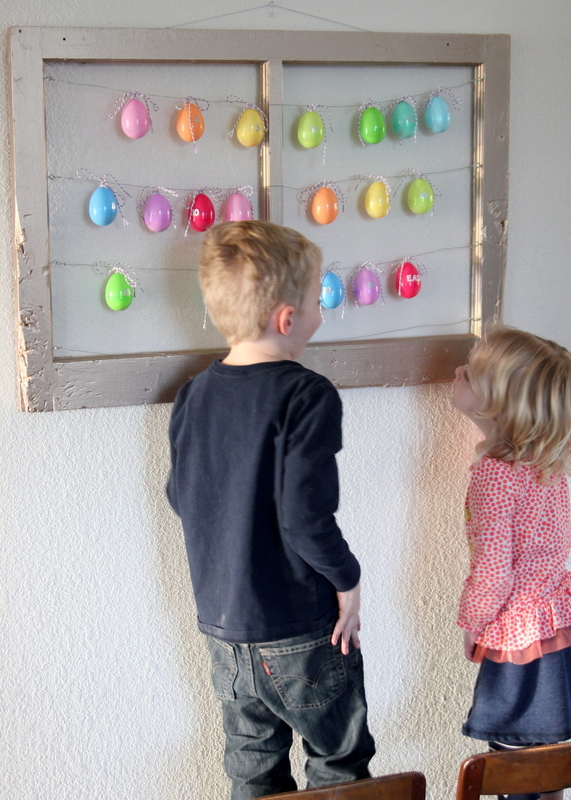 It is festive, and includes ‘celebration-y’ treats like ‘watch Veggie Tales Easter movie’ and ‘open your Easter baskets.’ Honestly, Burke and Pi are beyond excited just to have the countdown of brightly colored eggs, which achieves part of my ‘make Easter a big deal’ hopes. And then, the kids and I came up with some other activities as well. I asked them to think of ways we can thank God for everything He’s done for us and they came up with really great ideas. Some of it feels ‘be nice to people’-ish, but I am hoping that our conversations about grace can offset the just-work-hard-and-be-good mindset. -Watch the Veggie Tales Easter special. 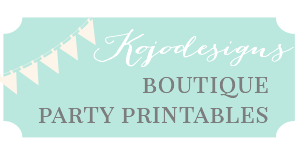 -Make something for someone as a surprise. -Make something for old people. -Give a homeless person a snack. -Give a homeless person real food, like a hamburger or one of our Saturday morning donuts. 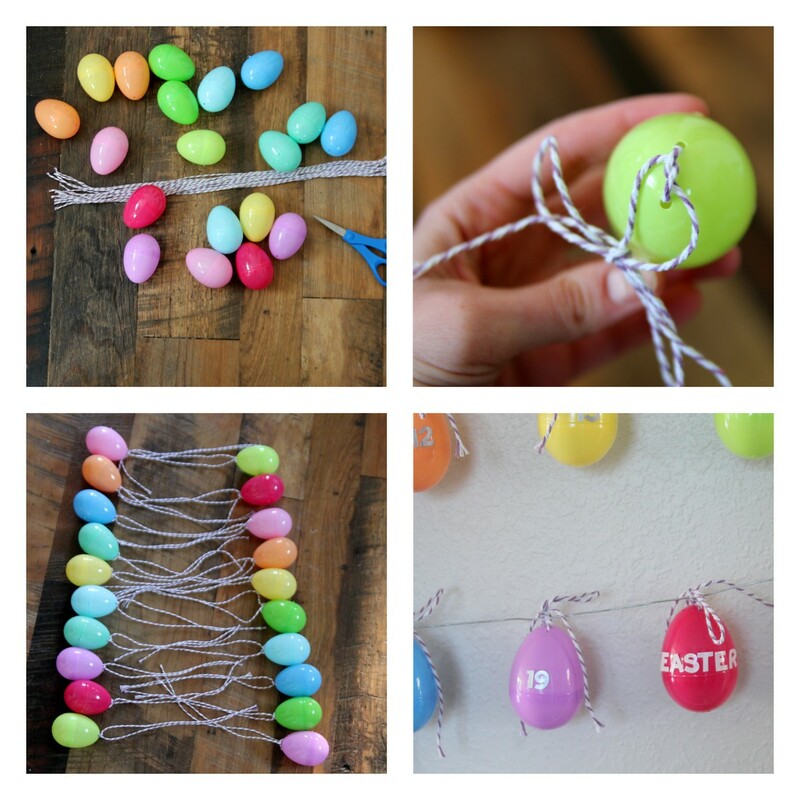 -Have an Easter egg hunt. -Meet our neighbors across the street. -Give a toy to a kid who needs it. -Make a special Easter dinner. -Do something nice for a friend. -Read the Good Friday story in the Jesus Storybook Bible. -Read the Easter story in the Jesus Storybook Bible. That’s only 18 things… we did a couple of them (‘share’ and ‘do something nice’) twice. Wow, I love your ideas and your commitment to teach grace, not just being nice! I hope when I have kids (well, and now! But especially when I am teaching little ones 🙂 ), that I am also able to make a big deal out of Easter and teach them about GRACE and what Jesus accomplished for us on that day. Thanks for sharing! “We don’t even have a baptismal, OR a youth pastor! ?” Haha. Happy Easter! It gladdens my heart to know that you are trying to inculcate a sense of God’s infinite mercy in your kids.The Lord is extremely forgiving and always merciful.And there is none like unto Him.So if Jesus ( May the Lord’s blessings be on him) walked the earth like a man , ate and drank like a man , then he cannot be the Lord, for he was a man like any other man. Oh, he was a great man , beloved of the Lord , a messenger just like messengers before him , sent down by the merciful Lord to guide mankind.He was a messenger like Abraham and Noah and Joseph and Jonas and Moses and David and Solomon before him.Oh yes , his was a miraculous birth , but so was Adam’s birth , who was created without both father and mother. The Lord said be and Jesus was – a true sign to people of the infinite power of the Creator. Jesus spoke from the cradle but never did he call on people to worship him. Worship the Lord , for He alone is worthy of worship. May the Lord guide you and your family. Great idea, Kirsten. 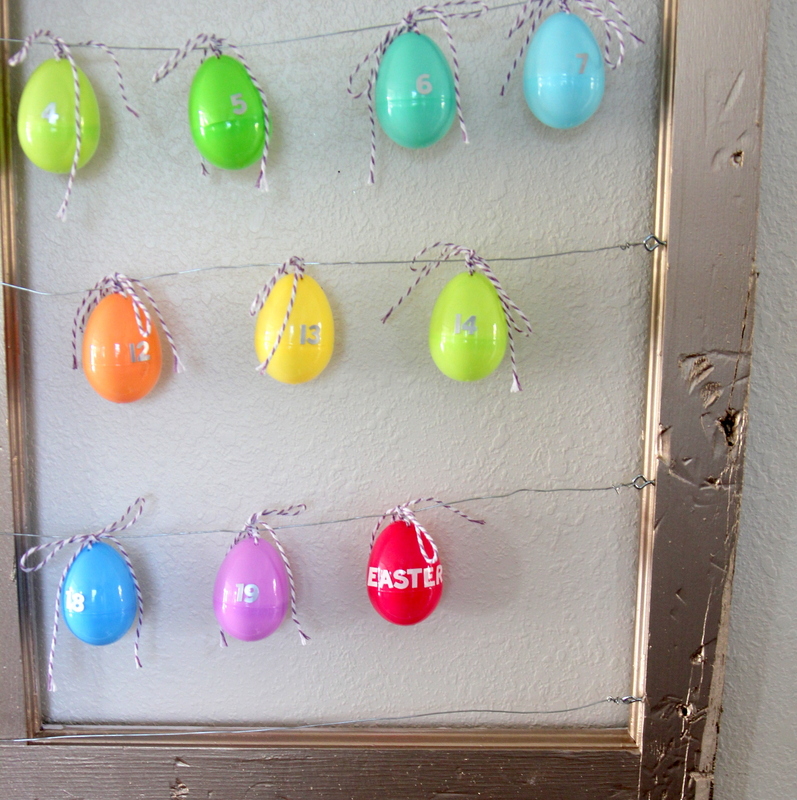 We don’t have an Easter countdown, but we have a set of Resurrection eggs. Have you seen them? You do it the 12 days leading up to Easter and each egg contains something symbolizing a part of the Easter story and a Scripture to go with it. I hear you on trying not to confuse the kids with the “try harder” or “be nice to people” thing. We ARE supposed to be kind, but not to earn God’s favor or love. Such a hard balance to strike, even for me as an adult! I couldn’t be more thrilled to echo your sentiments on Easter AND to copy shamelessly all of your activities. Easter really should be as big a deal as Christmas because it’s the “happily ever after” ending for Christmas. Thanks for a well-thought out approach and fun activities! Beth, I love this. My activities around here are mostly other people’s ideas as well… why reinvent the wheel when someone else is already doing something that resonates, right? this is so cute, such a great idea kirstin! Hey Kristin, I love this idea! I am always trying to talk to Jayce about why Easter is important, and admittedly, 3 year old J got “andthenJesusdied but then he was ALIVE again!” version. 4 year old J is going to have to get a little more of the real deal. Anyway, love the countdown, and I laughed at the different “meet the neighbors” suggestions. Not at you, but with you. Why is that so hard sometimes? We’re in the same boat, maybe we’ll get on that. It’s interesting to try to figure this stuff out year by year, right? Esp since it keeps changing. We are doing a food drive at my son’s kindergarten, so we talk a lot about how God has given us so much and now we can give to others. Maybe you can remind them that the kind acts are because of God’s kindness? Aww, what a wonderful idea!! Thank you so much for sharing. I would love to do something like this with my family. + How did you punch the holes in the top of the egg? Thanks so much!! Hey Robyn- the eggs had holes in the tops. Convenient, right? This is such a great idea! Thank you so much for sharing. I’m constantly looking for ways to teach my children about Easter, and the resurrection and point them toward Jesus and his ways. When they get a bit older, we’ll definitely be incorporating this into our traditions.